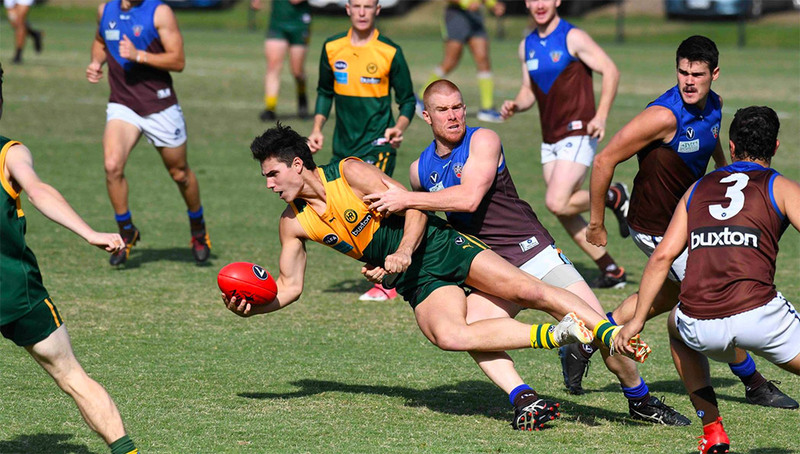 Ormond again proved too strong in the Grand Final rematch on Saturday, running out 21-point winners at Boss James Reserve. Ormond started strongly, at one point leading 28-0 before the home side pegged one back to trail by 22 points at quarter time. That first term proved to be the difference, with the Rovers unable to bridge the gap. The Rovers really fought out a tough last quarter. It was score for score for the full 30 minutes but the boys just couldn’t take control of the game; in fact, the margin at the end was the same as the three quarter time break. Hampton even outscored the Monders after that disastrous first quarter. Once again, it was a classic contest between two well matched teams but again, as has happened regularly in our most recent outings, Ormond manage to find a way to win. Daniel Corp was best for the Rovers, he never stopped all day. Scott Ebbott was also up there best as he imposed himself on the contest, gave options up forward and ran all day. Hodgy was hard at it all day and Ben Traeger-Haig battled hard. Joel Melnjak had a great duel with the Ormond gun, sharing the honours, and Fogs didn’t give up all day either. Great to see ruckman Josh Broadley back on deck and he’ll be better for the run. The day started with the traditional Home Game Luncheron where President Gary Nash led the assembled throng of over 80 guests through his plans for 2019, the challenges we have to face, the events we have through the year to look forward to, as well as hopefully more on field success. It was great to see the last 10 minutes of the lunch taken over by a desperate contest in the Ressies where the Rovers were able kick a late goal to secure a 5-point victory. The roar was something to behold. It was downhill from there as in the Seniors were completely overrun by the Monders early. In the first 15 minutes of the game, Ormond ran riot and had 4.4 on the scoreboard before Hampton managed to open their account and that was only in the last minute of the quarter. After the Easter break, the Rovers are back at the Boss, hosting Marcellin on what for us has traditionally been an ANZAC Day commemoration. However, unfortunately that won’t be the case this year as the Victorian RSL have put the kibosh on post-Anzac Day commemorations. We still have a great day planned though, some interesting interviewees and maybe even a couple of songs late in the lunch. Stay tuned for details. The Rovers Thirds travelled to St Mary’s and didn’t quiet have the depth they had last week so were always going to be up against it in their second game of the season. Ash Fisher added to his 7 goals from last week and a new player Kip Wilson was named best-on for the Rovers – a player definitely capable of playing senior football given his height and athletic ability. Henry Brayshaw played his first game back at the club since Juniors and put in a great performance. The boys simply ran out of legs and the opposition were too strong, going down by nine goals. Final score Rovers 11.7.73 – St Mary’s Salesian 20.8.128. Goals to H. Brayshaw 4, A. Fisher 3, P. Starcevich 2, R. Shwartz 2. Best: K. Wilson, B. Clarke, R. Jones, H. Brayshaw, B. Sheldrake, A. Fisher.